This is a very high level introduction to business phone systems aimed at conveying the right message to business owners, executives, stakeholders, and managers for over 10 years now. Depending on your certain situation, I am sure that the path you choose will surely put your company in a place to grow and increase the bottom line. As much as I want to share you with my knowledge of hiring awesome employees or looking for the coolest office site, I am here to guide you through the nuts and bolts of phone systems (yes, I am aware this is not the sexiest solution out there, but what the hey!). So, with the formalities out-of-the-way, let’s get to the business of phones, or more appropriately, the business phone system. I want to give you a base understanding of business phone systems. We will start with the basics, talk about the types of voice services, the various solutions, and other considerations. Before you can even begin to understand phone systems, we must first take a look inwards and understand who we are. Without getting philosophical, we want to take a snapshot of the current company’s telecommunications situation and create a profile. Specifically, we will want to take note of where the company is today, and where it wants to go. Click here to download a free business phone system worksheet. 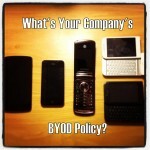 Note: number of handsets is less than the number of employees because logistics staff only share one phone. Before we can get into the various types of solutions that are available for your business, we need to take a step back and understand the types of voices business services that are available. What are voice services? And why is it important? Voice services is how your business connects to the rest of the world. It is pre-internet technology believe it or not. The dial tone does not just come to your phone by magic. Funny enough, as mentioned before, telecommunications is far from the sexiest technology out there, but it is still an essential service. Many business owners and stakeholders find it difficult to understand how it works, but as soon as it doesn’t work, get out of their way! Analog business lines, better known as the plain old telephone service (POTS), are business lines that provide a single analog communication circuit between the telecommunications company and your business. It is the traditional/basic service that has been available since the beginning (minus the person in the switchboard manually connecting lines of course). Each line has a unique number, let’s call it a phone number. POTS is still being offered and is still a reliable solution for routine business applications and locations. Having said that, the service is old and has no new features. When was the last time a new feature was released? Perhaps it was calling waiting, or maybe it was voicemail. Which were all great features. But since then, nothing. Keep in mind, these services run over ancient/aging technology that costs a fortune to not only upkeep, but to add any features. Besides the lack of features, business analog lines are limited to the number of voice channels. Each line provides one and only one connection. If your business is busy and expect to receive multiple calls, sometimes concurrently, the only solution you have is to get more lines. But wait, what about call waiting? Call waiting was marketed primarily for residential service. Giving subscribers a “virtual” line where they can accept a call. But there was no way to concurrently speak with both parties at the same time (until 3-way, but tha is a little advanced for this article). Additionally, it was not cost-effective for a residential subscriber to buy an additional line. For a company, we will want to get the right number of lines/circuits/voice paths that will accommodate the amount of calls as well as the number of employees in the office. OK, so how do we do that? If there are 10 employees, don’t we just get 10 lines? For every 4 employees share, they share 1 business line. If we go back to our scenario where we have 10 employee, what is the likelihood that everyone will be on the phone at the same time? If you are at work, look around, how many people are on the phone (unless you are in a call center)? For small business with less than 10 employees, it is typical to see three POTS lines: two for voice calls and one for a fax machine or point of sale (POS) device. The ratios change depending on the type of office profile. A warehouse or manufacturing plant with 100+ employees may only have 10 office staff resulting with only 5 business lines. Whereas, a contact or call center with 50 employees who are on the phone all the time. will need to have equal number of lines, 50. Digital business lines are typically delivered through a service called ISDN-PRI. It provides a digital communications circuit that gives subscribers a high quality service over existing phone lines. ISDN PRI delivers 23 voice channels over one circuit. Compare that to analog lines where you would have to 23 separate lines (and numbers). The digital solution is much more efficient and cost-effective. connections reduce line noise and interference so your customers enjoy digital performance when using high-bandwidth applications. lets your customers use multiple devices simultaneously on one phone line. reduces your infrastructure and maintenance costs for delivering high-speed connections due to its multi-channel technology. Note: unlike analog lines, digital lines require customer premise equipment (CPE) like a PBX (more on this in next section) to connect and terminate with. Business VoIP (voice over IP), is the delivery of voice communications using internet protocol (IP). In other words, the call can be delivered through the internet cloud. With the rise of internet usage and the speeds and quality has improved. It is a no-brainer to deliver voice over the same medium. This way, you can eliminate the use of analog or digital access resulting with lowering your operating costs. A traditional business phone system (PBX) sits at the customer premise and is sometimes called customer premise equipment (CPE). 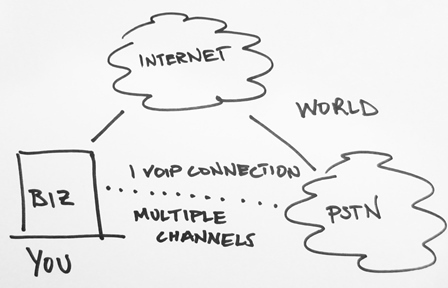 The PBX connects to the telecommunications company through analog or digital lines. The PBX manages and routes all inbound and outbound calls. An employee has a handset or extension where they can receive and take calls. The PBX provides all the features to the extension like caller ID, voicemail, conference, and etc. A hybrid solution is like that of a traditional PBX except that it can take advantage of the internet protocol (IP) and adapts VoIP technologies like SIP trunks. 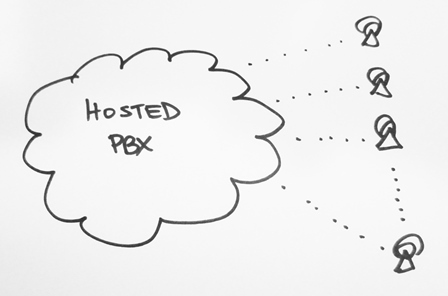 With a hybrid PBX, you are not limited to just analog and digital access, you can also connect to the PSTN through the internet. As mentioned earlier, VoIP lines are much more flexible as well as cost-effective. Companies with multiple locations can take advantage of VoIP by utilizing the cloud as a common infrastructure., thus lowering operations costs by eliminating redundant analog business lines. By doing so, all offices will be seamlessly connected and sharing all resources available. Also, since hybrid solutions have the ability of using VoIP, adding a telecommuting option to allow employees to work from home. Hosted phone, also known as virtual PBX, not only simplifies the solution by moving the entire PBX into the internet cloud. A common feature with hosted PBX is the ability to have multiple IVR Menus. Easily direct callers to the correct departments and end users within seconds of their inbound call starting. Integrating business processes to the phone system include CRM, ERP, and HRIS to streamline and lower costs to increase efficiencies. As mentioned, please let me know if you have any questions, comments, or concerns. I look forward to hearing from you.